DoLast lifting clamps are the solution for the transport of sheets and profiles and can be tailored precisely to your area of application. 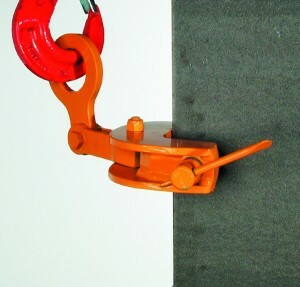 The use of clamps and grabbers is subject to the provisions of BGR 500 (formerly UVV 18.4). 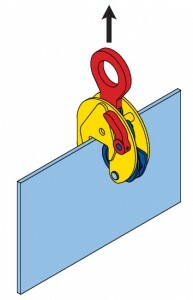 To transport vertically hanging sheets, clamps with safety levers must be used. 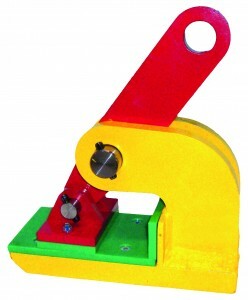 To erect lying plates and for laying down and turning them, there are suitable turn clamps. The drag on the clamp used as lifting system presses the hardened clamp jaw (pawl) with its grooves against the sheet so that a kind of micro form fit occurs. On the opposite side, a rosette presses into the sheet in the same way which should have a surface hardness between St 37 and St 52.3. 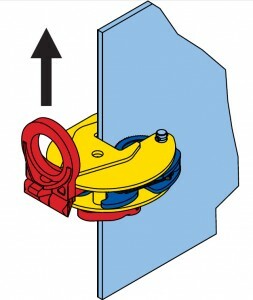 An internal spring ensures that the lifting clamp holds also when putting down the sheet, i.e. without lifting force. 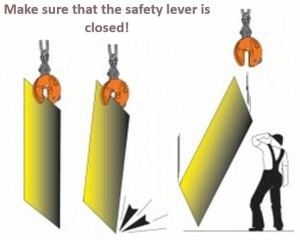 Only by loosening the safety lever, the sheet is released. The clamp effect through the lifting system is only sufficient if the thickenss of the sheet is in the clamp’s lever area. With a clamp with a lower grasper threshold of, for instance, 10 mm, too thin sheets of, for instance, 7 mm would slip through. Clamps for vertical transportation of sheets or plates are always suitable for transporting individual parts only. For horizontal sheet transport, there are lockable and non-lockable clamps. For thin sheets, which can bend and vibrate very strongly, the lockable models are recommended. In order to safely transport sheets or sheet packets horizontally, it is better to use DoLast lifting beams and 4 clamps. For dry and polished sheets, special clamps are available which have a higher pressure with even, non-corrugated pressing surfaces to avoid grooves in the sheet. 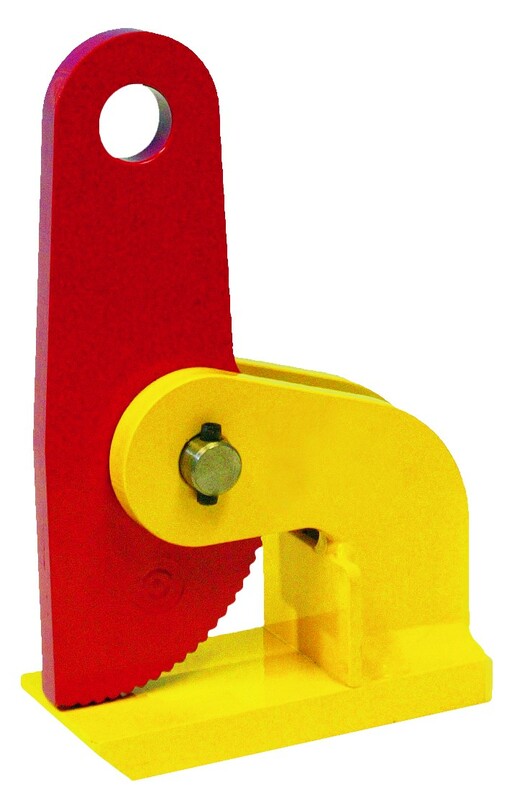 For special profiles, such as rails, sheet piles or doubleT beams, there are special clamps which partly also work by form fitting or blocking. 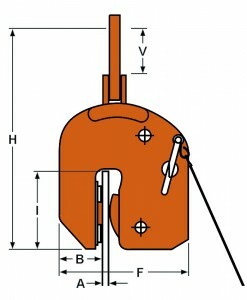 Distance-operated clamping is possible through compressed air or mechanically. This is especially suitable for clamp lifting beams, as the lifter – standing outside of the danger area – can trigger all clamps at the same time. For use with chemicals and for temperatures above 50° C, standard clamps are not suitable.The lever joints would soon be damaged. 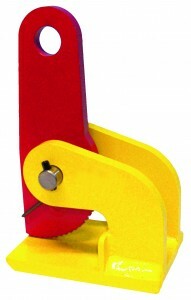 Special clamps are available to use with chemicals. Please enquire. 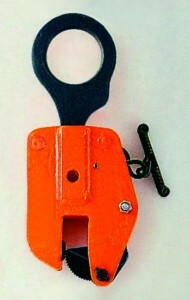 Due to different designs of the clamps, always observe the instructions of use supplied with the respective clamp model. As a rule, only use clamps with legible labels for carrying capacity, grabbing area and type plate. Notes on operation: The surfaces for the clamps on the transport goods must be right opposite of one another. The surfaces should be free from scale, dirt, lubricants or other covers. 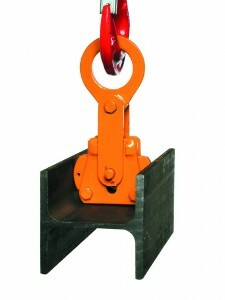 For vertical lifting with suitable clamps, only a part may be transported. 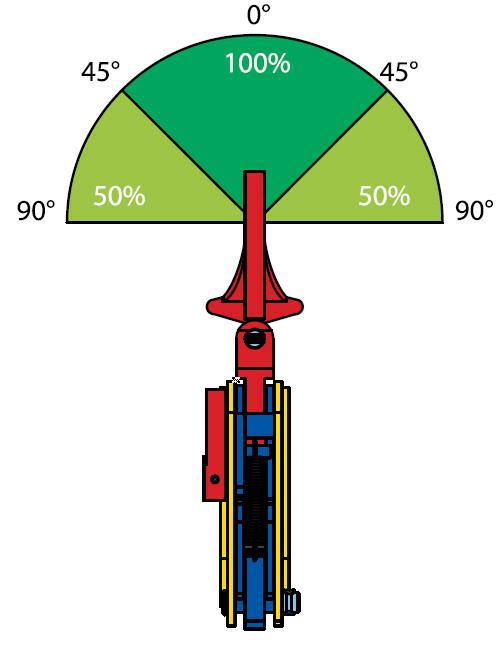 When erecting and turning with two or more lift clamps, the edge lying at the bottom must remain in contact with the floor.To prevent the load from swinging, it is lifted above the centre of gravity or preferably, two clamps are used. No persons should be located under hanging loads and in the danger area. Every clamp must be inspected before every commissioning and after any repairs as well as at least once a year by an expert. If used regularly, an inspection interval of no more than 3 months is recommended. The bolts, the housing, the suspension and levers must be checked for deformation and cracks. The grabbing parts must be replaced if they are visibly worn out. Here, every tooth must be checked because if the sheet thickness remains the same, only one tooth wears out. During inspection, the spring tension must also be checked. 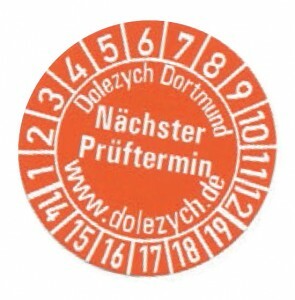 Worn out parts should be replaced by Dolezych. Only original spare parts guarantee the clamps’ functionality. Do 80 is available up to a carrying capacity of 30.000 kg. Lifting clamps with greater carrying capacity and larger grab range on request. The surface hardness of the transport good must not exceed HRC 37. Do 81 is available up to a carrying capacity of 30.000 kg. Lifting clamps with greater carrying capacity and larger grab range on request. 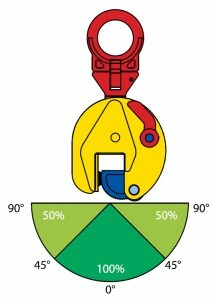 The safety clamp for sheet piles is suitable to turn sheet piles by 90°. 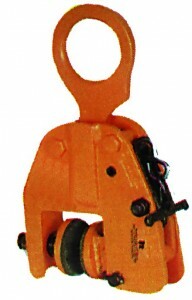 It has remote unlocking which means that the lifting clamp can be unlocked in height using a cable winch. 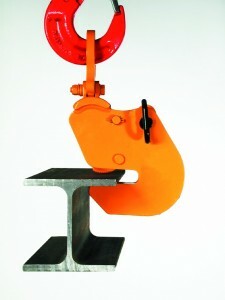 Vertical turning and lifting clamp, can be locked in closed position. Suitable for lifting and 90° turning of surfacesensitive materials (stainless steel, plastic, chipboard, etc.). 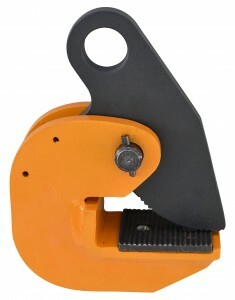 The specially coated grab jaws can be adjusted continuously with a position screw. Lifting clamp and smooth, large pressing plate for sheets with sensitive surface for vertical transport and for turning by 90°.This lifting clamp has a high pressing force and works by force-fit. The clamping force is designed for a minimum friction factor of 0.25 µ with double safety. From a carrying capacity of 2,500 kg on, the grab range can be adjusted with a position screw to increase the pressure. The surfaces of the sheets to be transported must be dry, clean and free from lubricants. MPS 1 model For vertical lifting and 180° turning of sheet, steel plates, beams and steel construction elements. 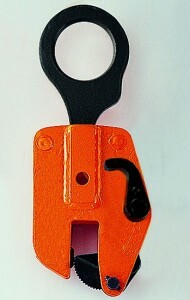 The safety lever to open the clamp can be locked in closed position with a lifted load. Unsupervised opening of the clamp when unloading is therefore prevented. 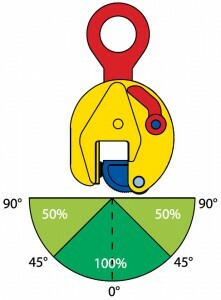 MPS 2 model Function and area of application as with model MPS 1, but the safety lever to open the clamp can be locked in open and closed position.This means that the clamp can be brought to the load in open position, fitted and locked. 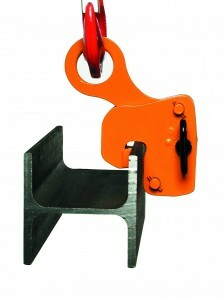 After dropping and securing the load, the “openly” locked clamp can be lifted with the crane. MPC 1 model For vertical lifting 180° turning and lateral lifting of sheet, steel plates, beams and steel construction elements. The safety lever to open the clamp can be locked in closed position with a lifted load. Unsupervised opening of the clamp when unloading is therefore prevented. 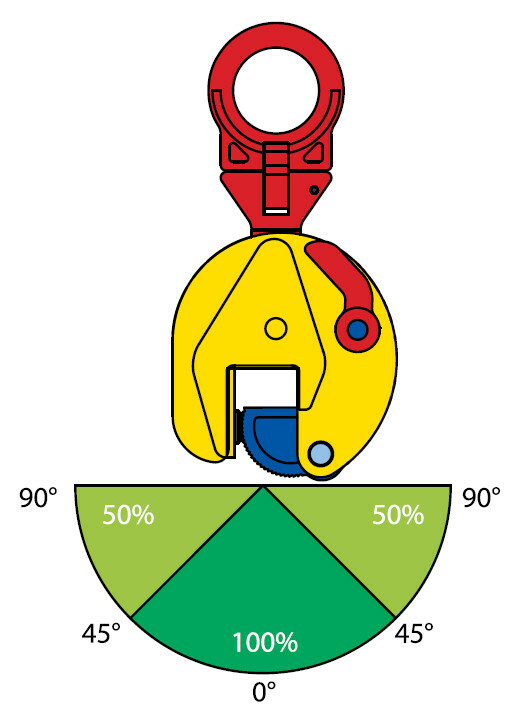 MPC 2 model Function and area of application as with model MPC 2, but the safety lever to open the clamp can be locked in open and closed position.This means that the clamp can be brought to the load in open position, fitted and locked. 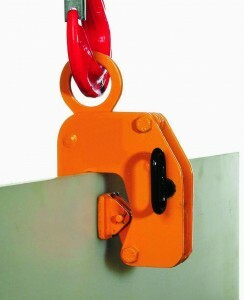 After dropping and securing the load, the “openly” locked clamp can be lifted with the crane. 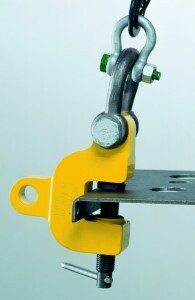 When transporting with only 2 clamps, there is a risk of the load swinging. It is not allowed to be present under transport goods of clamps and grabbers. NOTE! For horizontal lifting clamps, the carrying capacity is reduced in accordance with the angle of inclination of the lifting gear. 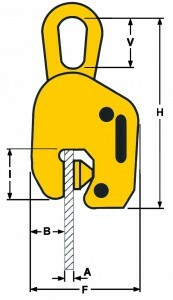 * = Also available with a grab range of 0 – 100 mm. 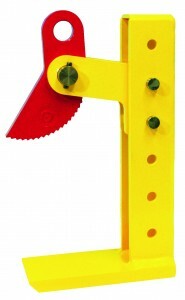 This horizontal lifting clamp hat a torsion spring that simplifies the positioning. 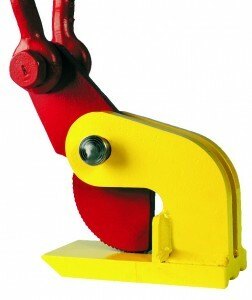 Lifting clamp for horizontal transport of sheets and sheet parcels. Suitable for many material thicknesses. Lifting clamps for use in pairs. 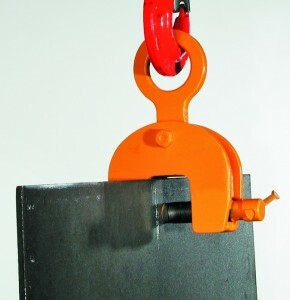 Horizontal lifting clamp for carrying and lifting of sheets or constructions that must not be damaged (e.g. of steel, aluminium, wood). 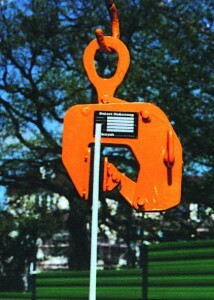 Lifting clamps for use in pairs. 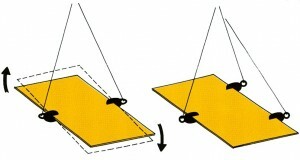 Lifting clamps for use in pairs. 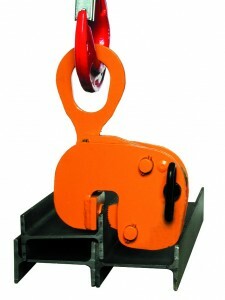 The lifting clamp lifts objects which fit into grab range. Fast, simple and safe. The large grab range allows usage for the most varied transport tasks in steel and machine construction for charging tool machines and construction installations as well as for welding and installing all kinds of components. 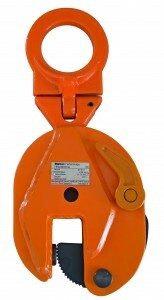 Due to the spring tension of the clamp jaws, the transport goods are also held if the lifting gear is released. Lifting clamps up to 2.0 t carrying capacity are equipped with round element chains and the grabbers with higher carrying capacity with roll chains (fleyer chains). Also available with protective coating for a surcharge. The screw clamp usable in two directions has great grab ranges and therefore offers multiple usage options. 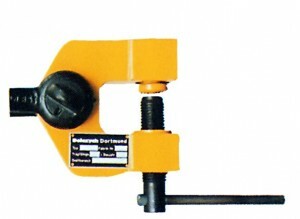 Screw clamp to lift, pull and turn by 180° sheets, beamsand steel constructions. The swivelling, bulk pressure plate creates high clamping through a wedge effect. 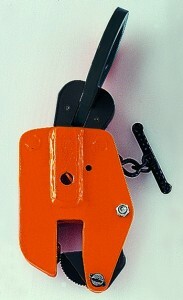 Screw clamp with laterally swivelling suspension eye. 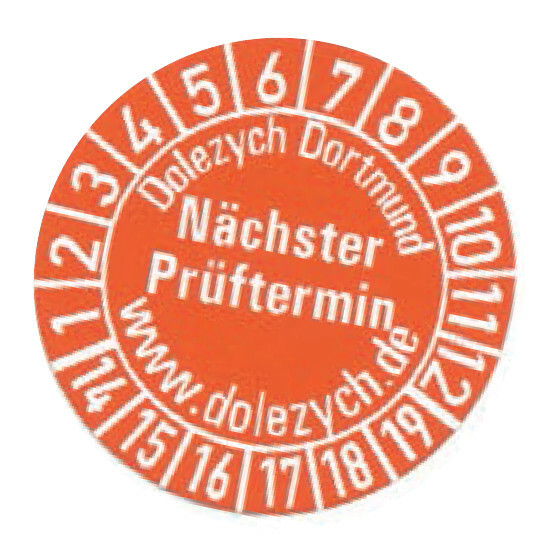 Variant Do 82 K is especially suitable for clinching sheets on chamfering machines. The Do 82 TSZ screw clamp can be loaded in all drag directions. It offers many areas of application in the transport of steel components, for feeding processing machines, chamfering sheets, etc. The surface hardness of the transport good must not exceed HRC 30. 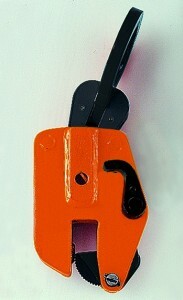 Lockable in open or closed position. Especially suitable for horizontal transportation.The suspension eye is in the beam centre of gravity. Universal use, also in pairs on the front of steel beams. 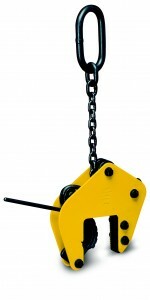 Also supplied with gimbal suspension: this version is especially suitable for lifting steel constructions in pairs. Ideal for the transportation of T, double T and U beams with vertical flange girder. 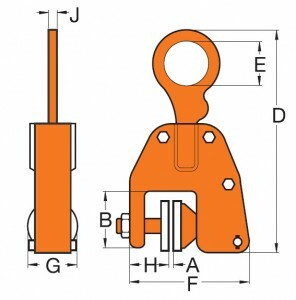 Due to their high pressing pressure, this clamp is perfectly suited to turn bearers. As internal clamp for broad flange beams to be piled into each other and at close range. Haven’t found the right product, yet?